For an apartment property management company, there’s always a few pokers in the fire. From dealing with day to day tenant issues, maintenance requests, and day-to-day office work, it’s easy to let landscaping slip through the cracks until you’ve got a problem on your hands. By working with a landscaping company, you can get ahead of problems, improve your appeal to new renters, and give your maintenance staff more time to focus on proactive work of their own. Learn more below. Tenants come and go: it’s a fact of property management. And when it comes to attracting new customers, first impressions are vital. And while the quality of the apartments themselves are critical, sometimes it’s curb appeal – how the exterior looks – that gets them in the door, and a big part of that is landscaping. Regular grounds keeping will make a huge impact, which can be further augmented through community projects such as plantings, hardscape installation, grading, and landscaping. Check out our blog, Now Renting: Apartment Landscaping for Curb Appeal, for more details. A big part of retaining tenants is making them invested in the apartment community. There are many ways of fostering this sense of community and friendliness towards both neighbors and the property managers, and your landscape should be a tool in your arsenal. Beyond community projects to create shared spaces, look at season displays as a way of fostering this, from seasonal flower beds in the spring to holiday lighting in the winter. Such displays go the extra mile for your tenants and also help to act as additional curb appeal for those who see your work. All of this advice for working with a landscaping company applies to both condo and leased commercial spaces as well. Condos can also utilize a retained landscaping company to help condo owners with landscaping projects to better keep them in line with guidelines and restrictions. On commercial properties, landscaping companies can help produce more worker-friendly outdoor spaces to overhauling a parking lot. Greener Horizon attends numerous tradeshows throughout the year such as the New England Condominium Show and New England Affordable Housing Management Association, keeping in touch with current and future clients, as well as to stay up to date with trends in technology and design. 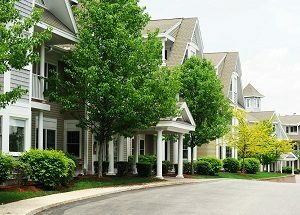 Learn more about our commercial landscaping services for eastern Massachusetts and Rhode Island on our Apartment Communities, Condominiums & Home Owners Associations page and contact us to learn more.